SHENZHEN, March 2 (Xinhua) — Zhao Xiaoyong was once called “China’s Van Gogh,” as the farmer turned oil painter made over 100,000 replicas of Van Gogh’s work over the past 20 years. However, he never saw a single authentic piece of the Dutch post-impressionist painter until 2014 when he finally saved enough for a trip to the Netherlands. Zhao is from Dafen, a village known for oil paintings in southern China’s Shenzhen City. Home to 1,200 studios and 8,000 painters, the village produces millions of replicas of Van Gogh, Monet and Picasso that are sold at home and abroad. According to statistics, 80 percent of oil paintings exported from China come from Dafen. While the market demand for replicas is shrinking, Zhao and other painters in the village are creating their own art styles and attracting tourists. Neighboring Hong Kong, Shenzhen is one of China’s first special economic zones for the country’s reform and opening drive. The painting industry started in Dafen Village in 1989 when Hong Kong purchasers sought to establish an oil painting base nearby. He sold his first works in 1999 when an American buyer ordered 20 paintings. More orders later came from abroad, prompting Zhao to recruit apprentices. Zhao and his team worked from 1 p.m. to 3 a.m. painting eight pieces per person every day at most. Prices for the replicas ranged from 200 yuan (30 U.S. dollars) to 3,000 yuan per piece, depending on the size. In 2008, when the economic recession hit most parts of the world, a drastic reduction of foreign orders forced Zhao to explore the domestic market. Profits kept shrinking after 2012 due to consumers’ diversifying tastes and rising costs. Since then, many painters in the village have given up making replicas and turned to innovation and creation. Chen Qiuzhi, who used to paint copies of masterpieces like Zhao, has worked hard to develop his own style, combining Chinese calligraphy with painting. To support him, his wife sold two apartments and had an art center built. The center, located at the far end of Dafen village, covers an exhibition area of over 3,000 square meters and has become a landmark of Dafen. Some 100 calligraphy works are exhibited at the center with other craftwork. Ten years of hard work has won him fame, with his works popular in the auction market. Now, one piece of his calligraphy is worth tens of thousands of yuan, almost 100 times the value of replicas he painted in the past. The art center also draws visitors. “Only by creation can one’s works be remembered,” said Chen. Today, Dafen has gathered nearly 300 art creators. In 2017, the annual output value of Dafen reached 4.15 billion yuan, among which the original works have accounted for 20 to 30 percent. From imitation to creation, Dafen Village has been making the transition from a low-end oil painting workshop cluster to an art center, said Liu Yajing, director of the village’s oil painting office. She said an oil painting museum, a performance theater, a training center and a hotel are being built to develop the village into a tourist resort featuring oil painting production, trade, training and exhibition. Compared with his Van Gogh replicas, painter Zhao finds his own works hard to sell. But he believes that he will finally be recognized someday in the future. “Imitation leads me nowhere. I will continue to concentrate on creation for the market and also for my dream as a real artist,” Zhao said. 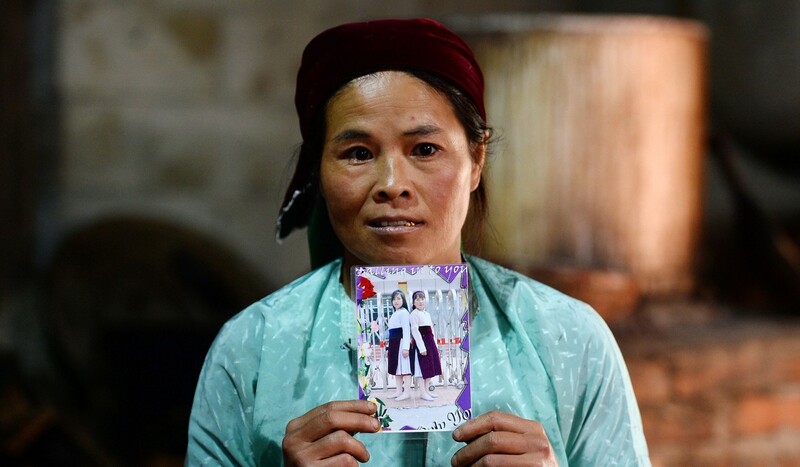 Vu Thi Dinh spent weeks scouring the rugged Vietnamese borderland near China after her teenage daughter vanished with her best friend, clutching a photo of the round-faced girls that she now fears have been sold as child brides. The anguished mother showed everyone she met the snap of the 16-year-old friends Dua and Di in white and red velvet dresses, the words “Falling Into You” printed above their picture. They went missing in February during an outing in Meo Vac, a poor mountainous border zone that is a stone’s throw from China. Their mothers fear they were sold in China on one of the world’s most well-trodden bride trafficking circuits. “I wish she would just call home to say she is safe, to say ‘please don’t worry about me, I’m gone but I’m safe,’” said Dinh, bursting into tears. High-school students talk of kidnapped cousins. Husbands recall wives who disappeared in the night. And mothers, like Dinh, fear they may never see their daughters again. “I warned her not to get on the backs of motorbikes or meet strange men at the market,” she says from her mud-floored home where she expectantly keeps a wardrobe full of her daughter’s clothes. She has not heard from Dua since she went missing, unable to reach her on the mobile phone she bought just a few weeks before she disappeared. The victims come from poor communities and are often tricked by boyfriends and sold, kidnapped against their will or moved across the border by choice for marriage or the promise of work. Like many of the missing, Dua and Di are from the Hmong ethnic minority, one of the country’s poorest and most marginalised groups. 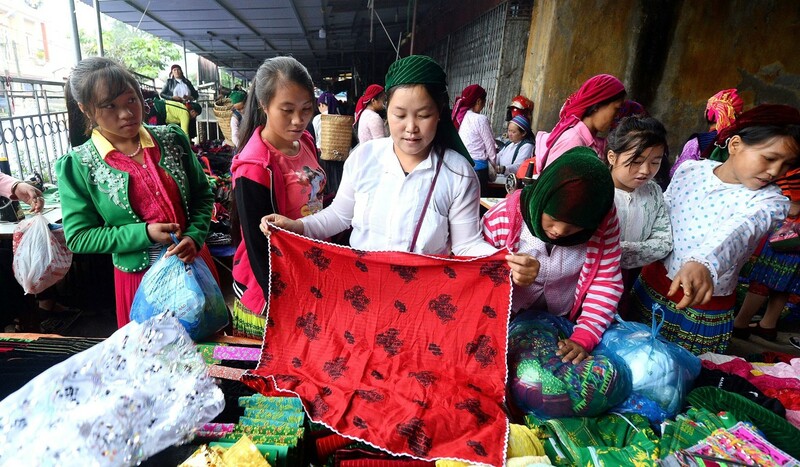 Traffickers target girls at the busy weekend market, where they roam around in packs dressed in their Sunday best, chatting to young men, eyeing the latest Made-in-China smartphones or shopping for lipstick and sparkly hair clips. Or they find them on Facebook, spending months courting their victims before luring them into China. It is a sinister departure from the traditional Hmong custom of zij poj niam, or marriage by capture, where a boyfriend kidnaps his young bride-to-be from her family home – sometimes with her consent, sometimes not. 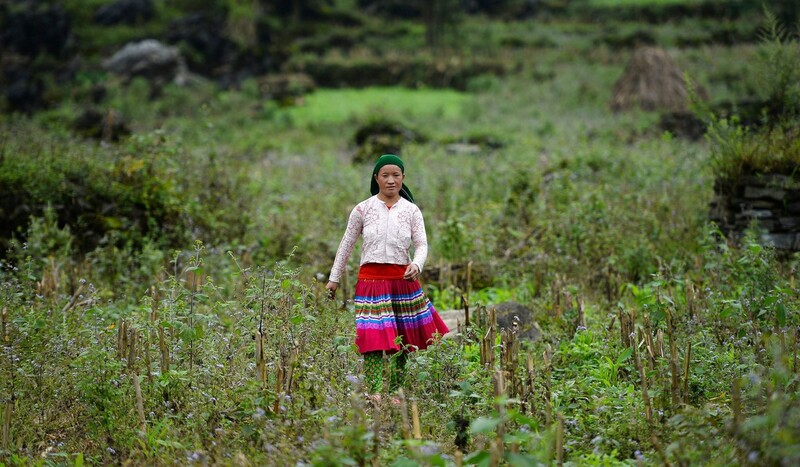 Others are enticed by the promise of a future brighter than that which awaits most girls who stay in Ha Giang: drop out of school, marry early and work the fields. “They go across the border to earn a living but may fall into the trap of the trafficking,” said Le Quynh Lan from the NGO Plan International in Vietnam. Vietnam registered some 3,000 human trafficking cases between 2012 and 2017. But the actual number is “for sure higher”, said Lan, as the border is largely unregulated. Ly Thi My never dreamed her daughter would be kidnapped, since the shy Di rarely went to the market or showed much interest in boys. Just two weeks after that photo shoot with Dua, the giggling girls went for a walk in the rocky fields near their homes. They never came back. “We think she was tricked and trafficked as a bride, we don’t know where she is now,” said My. Her worst fear is the teenagers are now child brides or have been forced to work in brothels in China where there are 33 million more men than women because of a long-entrenched preference for male heirs. The trip across the 1,300-kilometre border is an easy one, said Trieu Phi Cuong, an officer with Meo Vac’s criminal investigations unit. 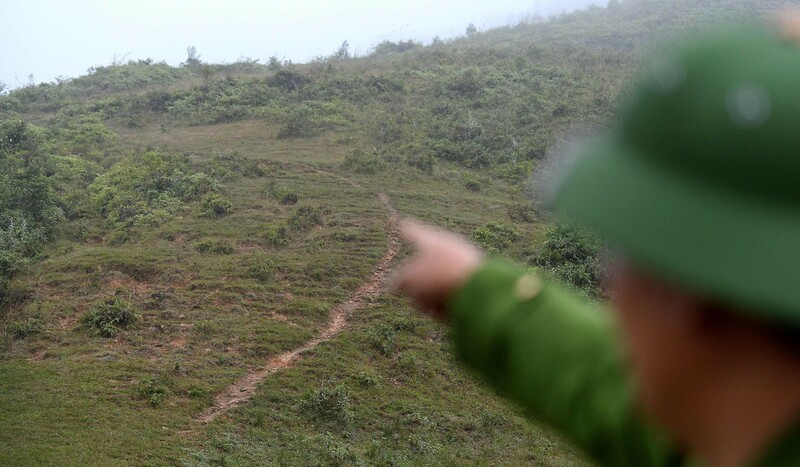 “This terrain is so rugged, it’s very hard to monitor,” he said at a border crossing marked by waist-high posts near where a Vietnamese man was selling a cage of pigeons to a customer on the China side. 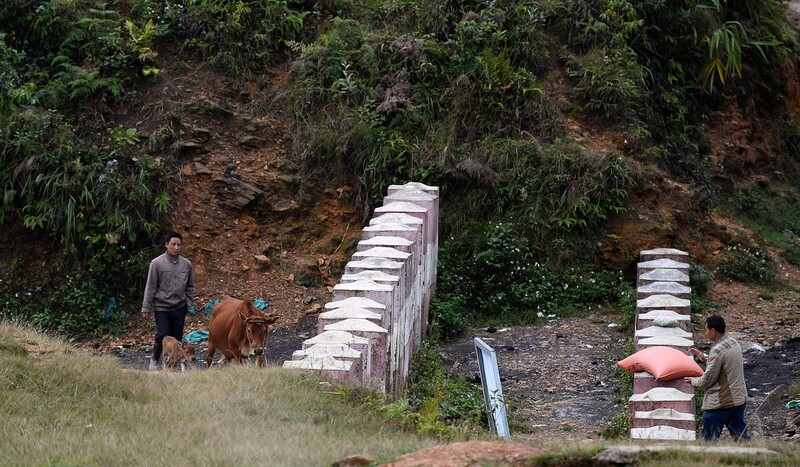 Many victims don’t even know they’ve crossed into China – or that they’ve been trafficked. 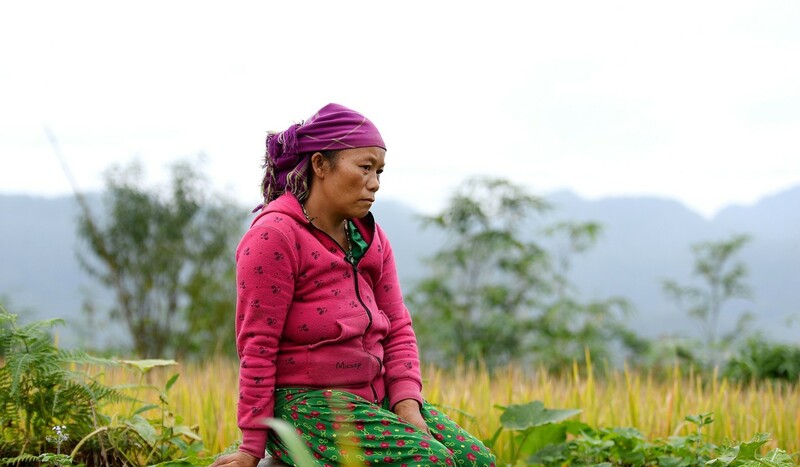 Lau Thi My was 35 and fed up with her husband, an abusive drunk, when she grabbed her son and headed to the border. She went with a neighbour who promised her good work in China, but she fell prey to traffickers. My was separated from her son and sold three times to different brokers before a Chinese man bought her as a wife for about US$2,800. “He locked me up several times, I hated him,” said My, who fled after 10 years by scrabbling together enough money for the journey home. She is now back with her Vietnamese husband – still a drinker – in the same home she escaped a decade ago, a smoke-filled lean-to where her dirt-streaked grandchildren run about. But she is desperate for word from her son. “I came back totally broken … and my son is still in China, I miss him a lot,” she said. China has lodged a strong complaint with India over a rare visit by a Taiwanese parliamentary delegation, warning New Delhi to follow one-China policy and refrain from any official contacts with Taipei. Sharply criticising the visit, foreign ministry spokesperson Geng Shung said Beijing had lodged a “solemn representation” with New Delhi to not have any official contact with Taiwan. Beijing has always opposed any kind of official contact between Taiwan and countries that have diplomatic ties with China, he said. Geng spoke against any proposal to upgrade India-Taiwan ties, and warned India to be strict about following the one-China policy and be “prudent” about its ties with Taiwan.India has no formal diplomatic relations with Taiwan. The de facto Indian embassy in Taipei is called the India-Taipei Association and the Taiwanese maintain the Taipei Economic Cultural Center in New Delhi. A three-member parliamentary delegation from Taiwan arrived in India on Monday for a three-day visit. The leader of the delegation, Kuan Bi-Ling, said Taiwan is “totally independent”. In September 2015, before she became Taiwan’s first woman president, Tsai had spoken about India being in focus for her country to strengthen ties.“Asean and India are poised to become two of the world’s largest economic bodies. Strengthening our overall relations is a natural choice for Taiwan as we diversify our economic and trade ties. In the future, we will form a new task force to actively pursue this policy objective,” Tsai had said in a key speech at the time. The New Southbound Policy Office, which directly functions under the president, will focus on strengthening all-round ties with Asean and South Asia, particularly India, Taiwanese diplomats had then told the Hindustan Times. Earlier on Wednesday, nationalistic tabloid Global Times said India is playing with fire and will suffer if it challenges the one-China policy and increases engagement with Taiwan. “At a time when new US President Donald Trump has put the brakes on challenging China over the Taiwan question, agreeing to change course and respecting the one-China policy, India stands out as a provocateur,” it said. “Some Indians view the Taiwan question as an Achilles’ heel of the mainland. India has long wanted to use the Taiwan question, the South China Sea and Dalai Lama issues as bargaining chips in dealing with China,” writer Yu Ning wrote in an opinion piece for the newspaper. “By challenging China over the Taiwan question, India is playing with fire,” Yu wrote. Theresa May has promised to work for a “golden era” in the UK’s relations with China, as the country’s vice-premier visits London for talks. Ma Kai‘s trip follows Mrs May’s decision after coming to power to delay approval of the part-Chinese-financed Hinkley Point C nuclear power plant. The project was given the go-ahead, after China warned that “mutual trust” was needed between the countries. Mr Ma is meeting Chancellor Philip Hammond to discuss investing in the UK. There will be an announcement that the Chinese contractor CITIC Construction is to invest £200m in the first phase of the £1.7bn London Royal Albert Docks project, headed by the Chinese developer ABP. And the UK will in turn invest up to £40m in the Asian Infrastructure Investment Bank based in Beijing, for a fund to help developing countries to prepare infrastructure programmes. US President-elect Donald Trump has said he wants to apply 45% tariff barriers to Chinese imports in an effort to protect free trade. One of Mrs May’s first acts on becoming prime minister during the summer was to order a review of the project to build Hinkley Point C, in Somerset, part-financed by China. The UK government approved Hinkley Point C in September, saying it had imposed “significant new safeguards” to protect national security. First cargo train from China to Iran arrived in Tehran on Monday, indicating a milestone in reviving the “Silk Road,” which has opened a new chapter of win-win cooperation between China and Iran. The train, also referred to as Silk Road train, has passed through Kazakhstan and Turkmenistan to Iran, travelling a distance of 10,399 kilometers. It had left Yiwu city in east China’s Zhejiang Province on January 28. This train was carrying dozens of cargo containers, according to the deputy of Iran’s Road and Urbanism Minister, Mohsen Pour-Aqaei, who made a welcome speech after the arrival of the cargo train at Tehran Train Station on Monday. The “Belt and Road” initiative was raised by Chinese President Xi Jinping in 2013, which refers to the New Silk Road Economic Belt, linking China with Europe through Central and Western Asia, and the 21st Century Maritime Silk Road, connecting China with Southeast Asian countries, Africa and Europe. “To revive the Silk Road Economic Belt, the launch of the train is an important move, since about 700 kilometers of trip has been done per day,” said Pour-Aqaei, who was present at the welcome ceremony of the train in Tehran’s Railway Station. “Compared to the sea voyage of the cargo ships from China’s Shanghai city to Iran’s Bandar Abbas port city, the travel time of the train was 30 days shorter,” he said. Pour-Aqaei, also the Managing Director of Iran’s Railway Company, added that according to the plan, there would be one such a trip from China to Iran every month. Chinese ambassador to Iran Pang Sen told Xinhua that as one of the cooperation projects after Chinese President Xi Jinping’s state visit to Iran, the cargo train is playing a important role to promote construction of the “Belt and Road” initiative. Indian Prime Minister Narendra Modi’s Air India aircraft made touchdown this morning at 10 a.m. in Heathrow for his long-awaited bilateral level visit to the United Kingdom — his first since becoming Prime Minister. He was met at the airport by Hugo Swire, Minister of State for the Foreign Office, and Priti Patel, Minister for Employment and Diaspora Champion in the David Cameron government. His visit carries expectations for agreements and partnerships worth billions of dollars across defence, security, finance and sectors like education, research and health. Mr. Modi is accompanied by a high power business delegation that included Cyrus P. Mistry, chairman, Tata Sons, Sunil Bharti Mittal, chairman, Bharti Enterprises Limited and N. Chandrasekaran, CEO and managing director of Tata Consultancy Services. Mr. Modi will be greeted by a Guard of Honour at Westminster,which will be followed by delegation level talks at 10 Downing Street with Mr. Cameron. The two Prime Ministers will address a joint press conference after which Mr. Modi will deliver his speech in parliament. He will also garland the statue of Mahatma Gandhi in Parliament Square. The evening will see important agreements between the two country delegations finalised at Guildhall, City of London. Mr. Modi will stay the night at the Prime Minister’s country residence at Chequers. The pomp and ceremony attached to the visit is expected to include a special tricolour flypast by the Red Arrows Royal Air Force (RAF) Aerobatic Team over the Buckingham Palace before the Prime Minister sits down for lunch with Queen Elizabeth II ahead of his mega diaspora address at the iconic Wembley Stadium in north London. 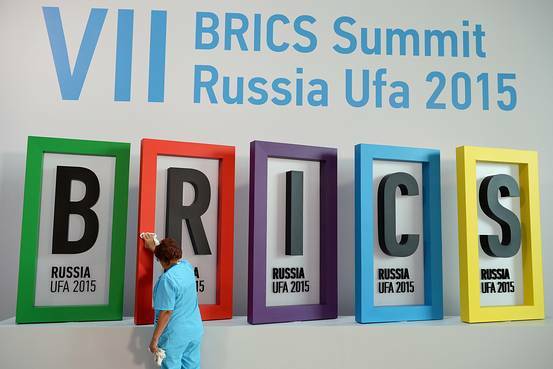 Like most families, the Brics bloc isn’t as happy as it looks from the outside. Brazil, Russia, India, China and South Africa, whose leaders begin a two-day summit today in Russia, are responsible for a growing share of the world’s trade-distorting policies but an even larger portion of trade-liberalizing ones, a new report finds. However, the temporary nature of some of the market-opening measures means that overall these countries are still discriminating significantly against their trade partners—many of which are fellow emerging markets. The finding, documented by the Global Trade Alert project of the London-based Centre for Economic Policy Research, highlights some of the awkward contradictions in the effort to unite the Brics. Global Trade Alert monitors trade-distorting moves such as tariffs, investment restrictions, “buy local” requirements for public procurement and export-promotion tools such as tax incentives and trade finance. GTA says its dataset includes more than 4,500 trade-related policies enacted globally since the financial crisis, more than double the number tracked by the World Trade Organization. The GTA database documents three major spikes in protectionism since 2008. Over that period, the Brics governments have implemented a total of 1,451 policies that favor domestic commercial interests over foreign ones, or 32% of such measures world-wide. The Brics countries have since unwound just a fifth of these, suggesting that protectionist walls weren’t raised merely as temporary crisis-fighting measures. The Brics account for 17% of world trade. Within the bloc, India stands out as an offender. According to GTA, the country is second only to the European Union both in the number of discriminatory measures imposed since November 2008—452 against the EU’s 604—and in the number of product categories affected by such measures—1,174 against the EU’s 1,220, both out of a possible 1,229. Rich-country protectionism is still alive and kicking, the report shows. Of the 2,733 economic policies that harmed at least one Brics member, a fifth came from a member of the G-7 group of nations—the U.S., Canada, Japan, Germany, France, U.K. and Italy—or Australia. Nearly a third, however, came from fellow Brics nations. All told, a greater share of G-7 policies were discriminatory, but the Brics’ protectionism affected a broader range of products. 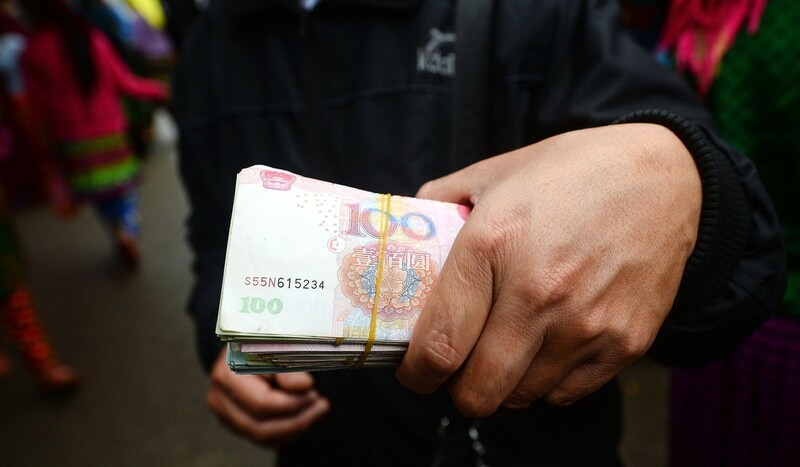 China was the most-common victim, with 2,153 foreign measures hitting its commercial interests. The Brics also account for an increasing share of reforms world-wide to lower obstacles to foreign firms and investors, the report finds. But 28% of these liberalizations have already lapsed, compared to the global average of 15%. Some economists say developing countries, in order to kick-start industrialization, need to shield and nurture local firms until they’re ready to compete on world markets. But Mr. Evenett argues that condoning “special and differential treatment” for poor countries doesn’t straightforwardly protect them against rich countries’ discrimination—it also provides cover for developing countries to step on other developing countries’ toes. China is the only one of the Brics whose exports haven’t stagnated over the past four years. via The Brics Are Harming Each Other’s Trade, and India Is Largely to Blame – India Real Time – WSJ. MADRID, Dec. 9 (Xinhua) — Madrid was the final destination on Tuesday for a train which has set the record for the longest train journey in history; 13,052 kilometers between the Chinese city of Yiwu and the Spanish capital. The train which arrived in Madrid at 11a.m. local time (1000GMT), departed from Yiwu on November 18th with 40 wagons, carrying 1,400 tons of cargo, consisting of stationary, craft products and products for the Christmas market and it will return to China filled with luxury Spanish produce such as cured ham, olive oil and wine. The results of this first historic journey which will then be evaluated with the aim of opening a regular two-way rail link between China and Spain, which could commence operations in early 2015. Two major advantages of rail travel are that the goods were transported much faster than would otherwise be possible by boat, arriving in Spain in half of the time a cargo vessel would need to cross from China to Spain, while the train produces 62 percent less carbon dioxide contamination less than a lorry making the same journey by road. The marathon journey crossed China, Kazakhstan, Russia, Belarus, Poland, Germany and France, before arriving in Spain with 30 of the wagons it had originally set out with. The 13,052 kilometers between Madrid and Yiwu is a greater distance than that between the north and south pole, although the distance was not covered using the same crew, nor the same engine. The engine was changed approximately every 800 kilometers, while the crew changes with each country the train traversed. Meanwhile special stops were necessary at the frontier cities of Dostyk (Kazakhstan), Brest (Belarus) and Irun (Spain) in order to deal with the different railway gauges encountered along the route. A host of dignitaries, such as Spain’s Public Works Minister Ana Pastor, the Mayor of Madrid Ana Botella, as well as the Director of Business at the Chinese Embassy in Madrid Mr. Huang Yazhong, and the Director of Commerce for the Government of Zhejiang Province Mr. Zhang Shuming. Mr. Huang said the journey showed the great importance China gave to strengthening relations with Europe, while thanking all of the authorities which had helped to make such a historic trajectory possible, while Mrs Botella commented that the 13,053 of railway which had made the historic feat possible was like a “new silk road for the 21st century, except that now the commerce will travel in both directions. via World’s longest train journey reaches its final destination in Madrid – Xinhua | English.news.cn.